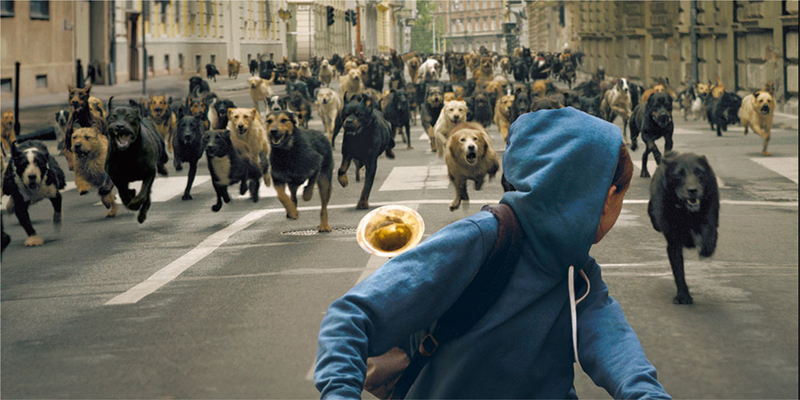 Kornél Mundruczó’s White God is the kind of movie that is difficult to explain to those who haven’t seen it without them thinking that perhaps one has gone a little mad. On one level, it is a political allegory involving the oppression of mongrels who rise up against a society that prefers pure national breeds and treats its mutts as disposable goods. It is also a tale of revenge of one dog, Hagen (Hagen, in a robust debut), against all of those who have robbed him of his dignity over the years, betraying whatever trust he might have formed for humanity. It is basically Dawn of the Planet of the Apes set in Budapest but with dogs. The movie also tells the story of a teen-aged girl, Lili (Zsófia Psotta), who has bonded with Hagen while coping with her parents’ divorce and whose life spins out of control and into open teen rebellion against the adults in her life once Hagen is taken from her. The relationship that humans and dogs have built over the years is complex, and it is uncertain which species benefits more from it. For those who keep dogs as pets and companions, the emotional bonds between the species can seem to be transformative. What Mundruczó depicts in White God is a cultural breakdown in which humanity isn’t very good at holding up to its end of the bargain with dogs. It’s a harsh world for “free” dogs in the movie, sure, but manageable if dogcatchers weren’t actively rounding up dogs and butchers weren’t so finicky about who is eating their garbage. Outside of the human/pet relationship, however, Hagen finds a world in which humans cannot be trusted, until he breaks and the film strays into a revenge drama territory (but with dogs!). White God excels in putting the violent world of dog fighting on display and Mundruczó is good at capturing enough of that world’s violence to make one cringe without actually showing it. I can believe that no dogs were harmed in making the movie, although editing makes it easy to believe that they might have been. The effectiveness in getting the point across relies a lot on the ability of Hagen to emote. How dogs do this is one of the mysteries of the species, but figuring out what was driving the dog at any given time was actually a little easier than figuring out what the people were up to from time to time. I think it is to the film’s credit that the dogs are portrayed as dogs in the film with understandable emotional states that don’t rely on human speech or CGI effects to humanize them. There are no “talking” dogs and the aspirations the dogs have is to trust humans and live with them, but not to become them. Hagen and Psotta are good in their roles as dog and the girl who won’t give up on the idea that they can be reunited. The adults are either caricatures of their occupations or inexplicably against dogs. I was never certain why Lili’s father (Sándor Zsótér) had it in for Hagen. Kind-hearted humans seem harder to come by in the film that they are on the everyday street. A few of the characters seem to prefer to investigate noises in dark rooms rather than turning on lights for reasons known only to them. Adults seem to exist to make themselves easy prey, although that is understandable given the absurd premise. In general, since there aren’t a lot of films like White God on the market at the moment. As dog movies go, White God never becomes overly saccharine about the relationship between dogs and children. It’s thrilling enough as a parable that it is suitable for tweens but one that their parents could enjoy watching with them. This entry was posted in Action, Drama, Foreign, Hungary, movie reviews and tagged 2014 movies, action film, Dog Movies, Hungarian Films., movie reviews, White God. Bookmark the permalink.